(TibetanReview.net, Oct31, 2018) – Mr Lodi Gyaltsen Gyari, best known as the Special Envoy of the Dalai Lama in nine rounds of talks with Chinese officials from 2002 to 2010 towards the settlement of the Tibet issue, has passed away in hospital in San Francisco on Oct 29 morning, aged 69. A day earlier, he was reported to be suffering from liver cancer. Mr Gyari was made the Special Envoy in 1990 and took additional charge as the President of Washington-based International Campaign for Tibet (ICT, founded in 1988 with Mr Tenzin Tethong as President) from 1991. He later became the ICT’s Executive Chairman of the Board in 1999 until his retirement in 2014. Under him, the ICT grew from an organization with little funding and fewer than 1,000 members to one with more than 75,000 members and with a multi-million dollar budget. The ICT currently has offices in Amsterdam, Berlin and Brussels as well. Mr Gyari’s appointment as special envoy was preceded by his designation by the Dalai Lama in May 1998 to initiate and lead a dialogue process with the government of the People’s Republic of China. The nine (ten, according to the Chinese) rounds of talks over a span of eight years ended with China rejecting and severely criticizing the Tibetan side’s 2008 memorandum and 2010 explanatory notes for an autonomous Tibet under Chinese rule. The Tibetan side said its proposal was fully in comport with China’s constitution, but Beijing trashed it as a disguised demand for independence. My Gyari then resigned as special envoy – along with envoy Kalsang Gyaltsen – with effect from Jun 1, 2012, citing futility of having dialogue with the Chinese side under the existing situation. However, he continued to remain on the Central Tibetan Administration’s task force on negotiations with China and took part in its meetings. The US Senate passed a resolution (S. Res. 557) that year, honouring his service as Special Envoy of the Dalai Lama and commending his achievements in building an international coalition of support for Tibet. However, Mr Gyari’s first visit to China took place back in 1982, followed by another one in 1984 as a part of a three-member high-level exile Tibetan delegation for exploratory talks. That was during the period (1979-85) when a series of fact-finding delegation visits to Tibet and China with different memberships took place. But it all ended without any further development. Before 1990, Mr Gyari served for decades at the senior most levels of the CTA, including as the speaker of the exile parliament and a member of its cabinet. Mr Gyari was born in 1949 into an influential family in Nyarong, Eastern Tibet, and recognized as the reincarnation of Khenchen Jampal Dewé Nyima from Lumorap Monastery where he received his early education. China’s annexation of Tibet disrupted his monastic education. After he arrived in exile in India, Mr Gyari was selected to be educated as a translator for the Tibetan resistance fighters being trained by the CIA in the United States. But he eventually ended up editing the Tibetan language publication Sheja and as the founder-editor in 1967 of the English language Voice of Tibet (which from Jan 1968 became Tibetan Review). He was also a co-founder, in 1970, of the Tibetan Youth Congress, which is the largest grassroots Tibetan non-governmental group. The group still campaigns for Tibet’s independence from Chinese rule while Gyari has for decades been striving for autonomy for Tibet. Mr Gyari was also the Chairman of the Board of the Conservancy for Tibetan Art and Culture, a US-based nonprofit organization working to preserve Tibet’s living cultural heritage in Tibetan cultural areas and communities around the world, working with leading institutions, scholars and religious leaders. He was a founder of a group called the Allied Committee, an organization formed to advance the common issues faced by the Tibetans, Uyghurs and Mongolians under Chinese rule. This initiative was stated to have inspired the founding of the Hague-based Unrepresented Nations and Peoples Organization, a worldwide organization established before the break-up of the Soviet Union to promote the rights of peoples and minorities through democracy and nonviolence. Another group of which he was a co-founder – with Michele Bohana, Joel McCleary and Lavinia Currier – in the 1990s was the Institute for Asian Democracy, stated to be one of the first, most enduring and effective organizations working for human rights and democratic reform in Burma. The CTA offices were closed and a prayer service held on Oct 30 for Mr Gyari with the participation of its full staff. “Today, we say goodbye to a true Tibetan patriot. 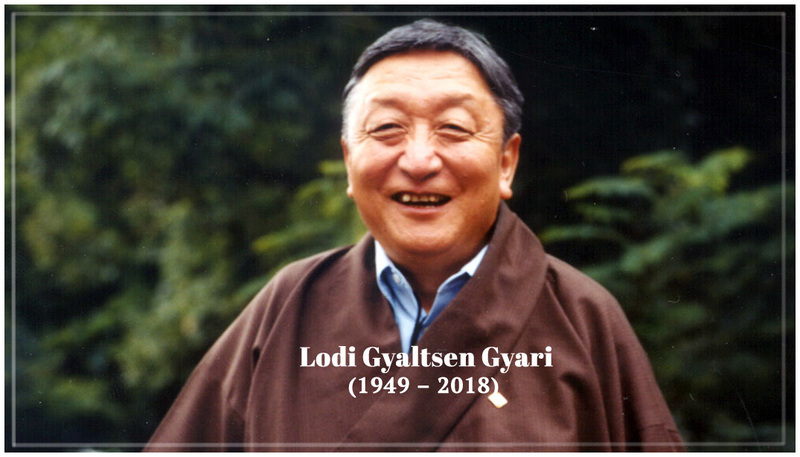 Lodi Gyari Rinpoche dedicated his entire life serving Tibet and the Tibetan people. He was a trailblazer and leaves behind a lasting legacy of public service. We are eternally grateful for his distinguished service,” CTA President Lobsang Sangay said on his social media page. ICT said Oct 29 that Mr Gyari devoted his time until his passing away in writing his memoir. The memoir is said to be in its final stages of completion. Mr Gyari, a US citizen, is survived by his wife, Dawa Chokyi, their six children, five grandchildren, his mother, as well as four brothers and three sisters. Did the Dalai Lama’s envoy visit China in November?